Saudi Arabia, United Arabs Emirates and Kuwait have pledged a $2.5 billion aid package to protests-hit Jordan, while the European Union announced a €20 million support to the Jordanian troubled economy. 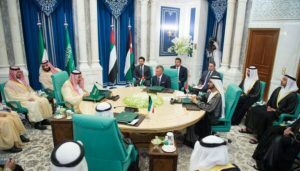 Saudi Arabia convened Sunday in Mecca an emergency Gulf summit over the social crisis in Jordan. Also in attendance, King Abdallah II received the support of Riyadh, Abu Dhabi and Kuwait City after the three approved to release an aid package worth $2.5 billion. The package, reports notes, will include a deposit in the Jordanian central bank, World Bank guarantees, budgetary support over five years and financing for development projects. The summit was called following a week-long social protests sparked by government’s decision to apply taxes on incomes in addition to already hiking commodities prices. The protests forced the country’s Prime Minister Hani al-Mulki to resign last Monday (May 4). He was replaced the following day by cabinet member Omar al-Razzaz who headed the education department. The country’s retired army leaders criticized al-Razzaz’s appointment by the king over claims that he does not suit the job. Also on Sunday, the EU announced it will support the Middle East country’s economy with €20 million ($23.5 million). Head of EU’s foreign policy Federica Mogherini at a press conference in Amman noted that Jordan needs economic support while pledging EU’s continued backing. The €20 million amount will be used to complete projects for “vulnerable populations of the kingdom which has received millions of Syrian refugees”. The Middle East country, which has implemented austerity measures and removed government subsidies on several basic commodities, contracted a $723-million loan from the International Monetary Fund (IMF) in 2016. The World Bank predicts “weak growth prospects” for this year. Budget deficit for the year 2018 has been put at $1.753 billion. Written by: KanelkaTagba on June 11, 2018. Posted by KanelkaTagba on Jun 11 2018. Filed under Finance, Gulf News, Headlines, World News. You can follow any responses to this entry through the RSS 2.0. Both comments and pings are currently closed.